Presentation from UN ICT Task Force Asia and Pacific regional meeting on Internet Governance. 21 May, Shanghai. I was asked to explain what's happened since the Summit, comment on what was said at the ITU's expert workshop and UN ICT Task Force Global Forum. A 20 minute presentation in 10. 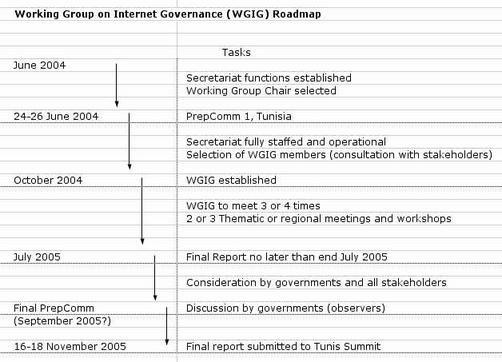 Internet governance working group -- roadmap of known tasks. Not official, my interpretation of comments made by Markus Kummer at various meetings.